Can electrical gizmo boost diesel efficiency? At last here's an electro-mechanical gadget that might have some real science behind it. The department of physics at Temple University in Philadelphia claims that a 'simple device' it developed can improve fuel efficiency by up to 20 per cent. The gizmo consists of an electrically-charged tube attached to a car's fuel line. 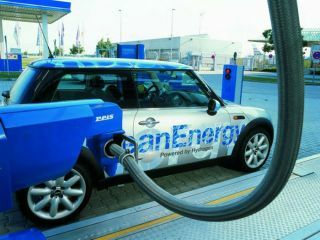 Using power from the vehicle's battery, the device creates an electric field that thins fuel so that smaller droplets are injected into the engine. That leads to more efficient and cleaner combustion than a standard fuel injector, says Rongjia Tao, Chair of the university's Physics Department. In tests with a diesel Mercedes-Benz, the device reportedly increased highway mileages by 20 per cent (from 32 to 38 mpg) and city driving by 15 per cent. Temple has applied for a patent on its technology, and has licensed it to a commercial company called Save The World Air. Wait a second – is the world running out of air?! It's probably the Chinese again. Or is it Wall Street this week? According to Joe Dell, marketing drone, STWA is working with a local trucking company to test the device on its diesel-powered lorries, where he estimates it could increase fuel efficiency between 6 and 12 per cent. So already the figures are dropping. Any bets that by the time it gets to market, car makers will simply have tweaked their fuel injectors to deliver similar results themselves?